Multiple Sclerosis imaging research at Robarts Research Institute received a $50,000 boost today. 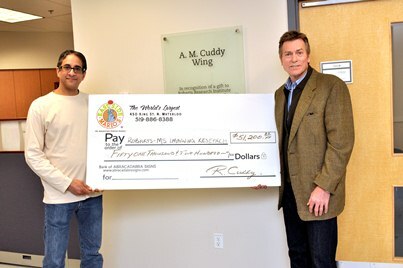 East Side Mario's owner, Rob Cuddy was on hand to deliver a $51,200 cheque to support the work of Ravi Menon and his team. Menon's lab is working to view the central nervous system of MS patients for early diagnosis and monitoring of the disease. For Rob Cuddy, raising funds for Multiple Sclerosis imaging research is a cause close to his heart. When Cuddy's late father, Mac, was diagnosed with the disease, he knew medical research couldn't help him, but that someday it might help others. He donated the original $1 million to establish the A.M. Cuddy Wing at Robarts Research Institute. Today, the Cuddy Wing is home to the 7T Tesla human MRI system used to capture microscopic images of the central nervous system in MS patients. Rob's wife, Jane, was also diagnosed with MS. In keeping with both his father's vision and a desire to help current sufferers of the disease, Cuddy has dedicated his time and energy over the past two years to raise money for Menon and his team. The funds are the direct proceeds from an annual evening of entertainment and music, this year featuring Canadian songstress Serena Ryder. The event was launched last year with the help of singer-songwriter Jim Cuddy, and has raised over $100,000 in the past two years. Proceeds from this year's event will support the development of software tools to allow clinical collaborators to view new human MS images generated in Menon's lab. "It is this kind of translational research that is a critical piece in allowing research to be translated into diagnostic modalities," says Menon. "And that wouldn't be possible without this support."